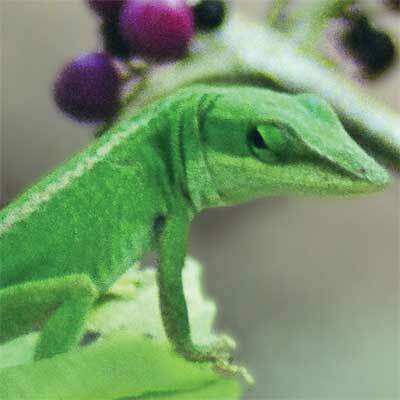 The green anole (Anolis carolinensis) often is mistakenly called chameleon because of its ability to change color, choosing green or brown to help it avoid predators by blending into its background. It feeds on insects and is common at Savannah River Site and in yards and woodlands from North Carolina to Texas. Males have a pink throat fan that they frequently expand in territorial displays. This anole, photographed in a wooded area near the site's TNX Kaolin Settling Basin, is perched on an American beauty berry (Callicarpa americana), a native deciduous shrub seen throughout the coastal plain of the southeastern states. The plant's purple fruits, which mature from August to October, are deemed edible but are pungent and astringent after an initial sweet taste. The fruits are eaten by birds, and the plants often are established as a wildlife-attracting species. The photograph for the 2005 SRS Environmental Report cover was taken by Al Mamatey of the Washington Savannah River Company's Environmental Services Section. The cover was designed by Eleanor Justice of the company's Documentation and Information Services Section – Information Management and Program Support Group.